Previously secret records relating to the 1981 Hunger Strike are now available online. The documents have been added to the Conflict Archive on the INternet (CAIN) website as part of ongoing work between the University of Ulster and the Public Record Office of Northern Ireland (PRONI). Minister for Culture, Arts and Leisure, CarÃ¡l NÃ­ ChuilÃ­n, today visited the Belfast campus, where she launched the latest collection of material. 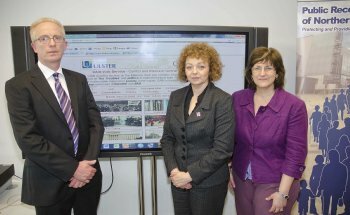 Staff at the University and PRONI have worked together to make the records freely available on http://cain.ulster.ac.uk/proni. In October 2010 an initial selection of records for the years 1968 to 1979 was made available. This was made up of hundreds of government records, formerly classified as restricted or secret. Today’s additional selection of material deals with the year 1981 and covers such topics as the 1981 Republican Hunger Strike, Anglo-Irish relations as well as ongoing political and security matters relating to Northern Ireland. Minister NÃ­ ChuilÃ­n was welcomed to the Belfast campus by University of Ulster, Pro-Vice Chancellor, Professor Alastair Adair; Director of INCORE, Professor Brandon Hamber; Deputy Director of CAIN, Dr Brendan Lynn; Director PRONI, Aileen McClintock and PRONI staff David Huddleston and Graham Jackson. Speaking at the launch, Minister NÃ­ ChuilÃ­n said: “This additional material covers a wide range of records relating to 1981, and focuses particularly on the Hunger Strike. “These documents provide valuable additional research material for students, citizens and researchers. It is important that technology and partnerships are utilised in this way so that some of the Public Record Office's key documents on 1981 can be analysed online anywhere in the world. “In the period ahead, I wish to see even greater access to public records since this can only help to enhance our understanding of the past." Dr Brendan Lynn is available for interview. Pic 1: (L to R)Dr Brendan Lynn, Deputy Director CAIN, withCarÃ¡l NÃ­ ChuilÃ­n, Minister for Culture, Arts and Leisure andAileen McClintock, Director of PRONI at the launch. *The CAIN website (http://cain.ulster.ac.uk/proni) provides an extensive range of information and source material on the conflict and politics of Northern Ireland from 1968 to the present day. The site is used by a worldwide audience and has received more than 15 million visits since it was launched in March 1997. *CAIN is a component of ARK (Access Research Knowledge, http://www.ark.ac.uk/) a resource providing access to social and political material on Northern Ireland that inform social and political debate in the region and raises the profile of social science research.